A wedding is not like a wedding — two individuals decide to unite their lives. Every person has got his or her own personality, character and ideas. Therefore every wedding has to be different from another. It cannot be bought 'off-the-peg'. We are aware of your individuality and able to organise a wedding made-to-measure; your measure — it has to fit you and nobody else! We are experts and consider all your particular requests seriously. We let your dream come true: big party, only close friends and family, a romantic escape in two, traditional or individual, classic or modern, country-style or elegant, castle or villa or seaside. Feel free to discuss all options with us. 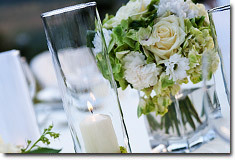 Let us know in which wedding venue you are interested. Send us your wishes through our contact form via e-mail, fax or traditional mail. We will elaborate a plan of costs based on your budget and a wedding concept based on your personal ideas, so that you can imagine how your wedding in Italy could be. You may weigh up the pros and cons then decide if to go ahead with the planning. We are on your disposal for any further information and explanation. Of course we will respect your privacy and take care of all given information according to the Data Protection Laws. I collaborate with the best party & catering-services in the area. 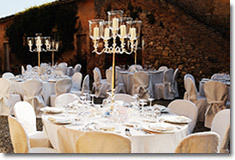 Primarily they offer Italian and local specialities, but are also able to provide some international dishes for your wedding reception in Tuscany. If you have certain preferences or special requests (allergies, vegans, vegetarians) they will be able to satisfy your wishes. 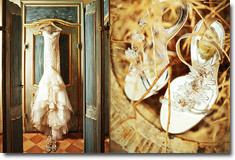 They are experts in the Italian style – probably one of the reasons why you have chosen Italy for your wedding. Ask us for a detailed description of their offers and menu proposals! If you have the chance to visit Tuscany before the big day, you may sample their cooking before making your decision. Of course we will take care of the musical accompaniment on your wedding day as well. 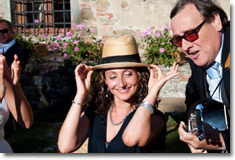 You may choose from a wide variety of different kinds of musicians as live music or professional electronic equipment with DJ, solo musicians, or ensembles of various instruments including harp, voice, strings, even live rock bands and different types of music as classical, traditional italian or international, modern, jazz, rock etc. Music is a fundamental part of your wedding day because it creates special moments, the memory of which will return to you every time you hear that music again. The style you choose is also a reflection of your individual personality and taste. Usually Italian brides are elegantly dressed and made up, while brides from other countries often choose a more natural look. The beauty artists are 'like the photographer' skilled in meeting every kind of preference. Feel free to discuss all options with us. The transportation to the ceremony is an important detail of your wedding day, as can be seen afterwards in many wedding photos. 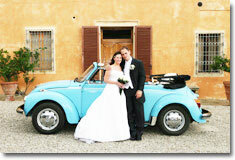 The arrival of the brides car, the walk of bride and groom through the beautiful Tuscan landscape after the wedding or along medieval streets of one of the museum towns become emotionally rich moments of your wedding day. You will admire the photos again and again for your whole life. Therefore the transportation should be chosen well: old-timer or limousine, convertible or just a 'normal' car of a certain colour, motorbike with side car, or horse-drawn carriage. Some wedding couples have chosen to ride on a 'Vespa' scooter like Cary Grant and Audrey Hepburn; other prefer to walk through the town, receiving warm wishes and cheers from the local people. You may even choose whether to drive yourself or hire a driver.